Believe it or not, labor unions are finding a home in President Donald Trump’s America First vision. As globalist companies such as Amazon fight unionization, “Democrats have veered left off a cliff since the days when they truly served as a valuable partner for unions,” columnist Joe Schaeffer wrote for LibertyNation. A video leaked to Gizmodo recently shows Amazon teaching its managers how to oppose unionization. Trump’s 2016 victory provided “responsible unions a natural home in an America First movement that values U.S. manufacturing and prioritizes employment over consumerism,” Schaeffer wrote. Labor unions could also be big winners in Trump’s newly-negotiated trade deals with Mexico and Canada. The Wall Street Journal reported in August that unions could particularly benefit from two mandates in Trump’s deal with Mexico: That 75 percent of a car be made up of North American-built components to qualify for importation into the U.S. without high tariffs, and that 40-45 percent of cars and trucks be made by workers earning at least $16 an hour. “These are pretty meaty improvements in areas they care about,” Jared Bernstein, who served as chief economist to Vice President Joe Biden, told the Journal about union reactions to the deal. 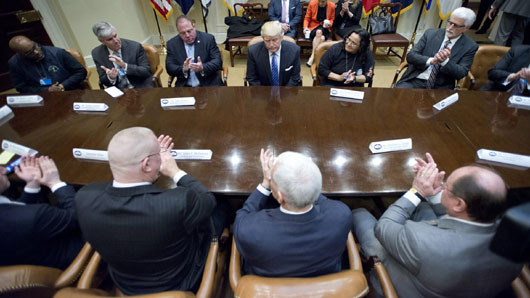 Unions also cheered when Trump, in one of his first acts after assuming office in January 2017, pulled the U.S. out of the Trans-Pacific Partnership (TPP). “We believe that President Trump really is going to put America first … I’ve been around this town long enough to know things are said in the heat of battle. The details we just heard from the president, we’re very excited about,” Sean McGarvey, president of North America’s Building Trades Unions, said at the time.